It’s the finer details that really bring a wedding together, the décor you choose will help to set the tone and shape your event. Planning a wedding is a big undertaking, that’s why we are here to help you with some wedding ideas. Below are some of the latest trends that are the perfect addition to any wedding. Brighten the day and give the photos of your special day an edge with these gorgeous props. Make a big statement and add some wow factor with incredible lit up letters. The 5ft LED letters provide a visual centrepiece and a breathtaking feature to your wedding. This trend is fast becoming an integral part of many weddings, most commonly couples want to keep it simple with the word “LOVE” illuminating their special day. You can choose to have the words MR & MRS / MR & MR / MRS & MRS too. Whatever design you choose, there is no doubt these letters will add a spectacular backdrop to your reception and will illuminate your venue. 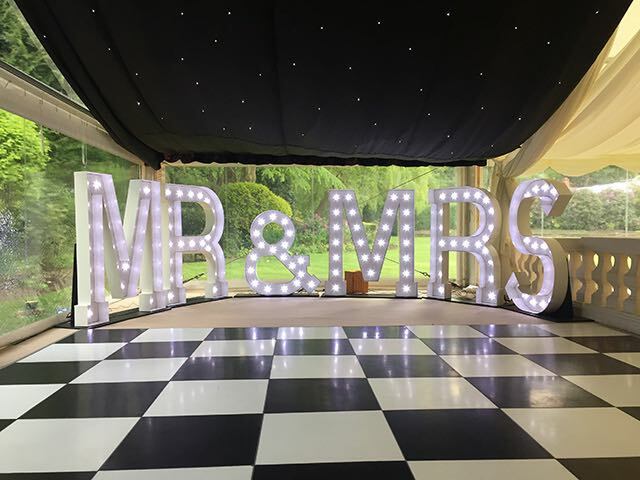 Giant wedding letters hire is available from Fun 4 Hire, these letters are excellent quality and made from steel with built in LED lights to set the romantic mood. When looking for giant letters hire near you, beware of cheap MDF imitations of these beautiful letters. Want to bring some life and party spirit to the reception? An LED dancefloor can get your guests up and moving all night long while the lights of the dancefloor sparkle underfoot. This is an elegant and appealing approach to the dancefloor, one of the key features of any wedding. The lights of the floor twinkle like stars on the clearest night, giving you a romantic and intimate setting that will leave your guests in awe and ready to dance. Dancefloor hire allows you an affordable and easy way to add that little bit extra to your day. Lighting is an incredibly important aspect of wedding planning. The lighting can be stylistic and is essential for bringing ambiance to your special day. In addition to the main lighting scheme, you can use props to provide soft lighting without the need for obvious and unsightly lighting instruments. Adding your own take on the lighting can help to make the day yours and will bring some magic to your photographs. The wedding ideas above (LED dance floor and giant LED letters) are both ways to add some mood lighting to your wedding while keeping the style and romance on point. When looking for ways to add lighting to your wedding without being to over the top, these props provide the perfect opportunity. The best part of all is that dance floor hire and giant letters hire are affordable options that’ll add so much to your day. Even when the lights go down the dance floor will be inviting and the specially chosen lettering will be glowing.